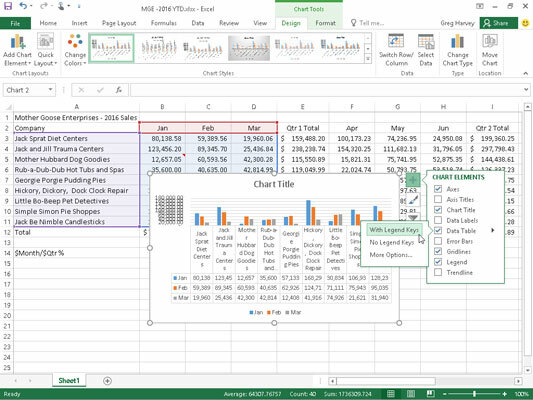 In Excel 2016 the Chart Elements button (with the plus sign icon) that appears to the right of an embedded chart when it’s selected contains a list of the major chart elements that you can add to your chart. To add an element to your chart, click the Chart Elements button to display an alphabetical list of all the elements, Axes through Trendline. To add a particular element missing from the chart, select the element’s check box in the list to put a check mark in it. To remove a particular element currently displayed in the chart, select the element’s check box to remove its check mark. To add or remove just part of a particular chart element or, in some cases as with the Chart Title, Data Labels, Data Table, Error Bars, Legend, and Trendline, to also specify its layout, you select the desired option on the element’s continuation menu. Sometimes, instead of data labels that can easily obscure the data points in the chart, you’ll want Excel to draw a data table beneath the chart showing the worksheet data it represents in graphic form. The following figure illustrates how the sample clustered column chart looks with a data table added to it. This data table includes the legend keys as its first column. Embedded clustered column chart with data table with legend keys. If you decide that displaying the worksheet data in a table at the bottom of the chart is no longer necessary, simply click the None option on the Data Table button’s drop-down menu on the Layout tab of the Chart Tools contextual tab.